This article has been adapted from chapter 8 of The Lives Around Us: Daily Meditations for Nature Connection by Dan Papworth. In this chapter, Dan Papworth seeks to discover what the Magpie can teach us about seeking peace and trust in the face of an uncertain world. She is, of course, another crow (Corvid) and her emergence makes me wonder. Why is this family of birds coming to prominence as I write? They fly darkly into the imagination, enigmatic and self-contained. But perhaps that question why will remain unanswered. Perhaps it is the least valuable of all questions. It is the one we learn to grasp at a very young age, usually between two and three, when we have begun to develop language but not yet reasoned thought. A battle of wills begins and we are called, invited, to let it go. “Why?” is a question that always raises the past but whether we receive a satisfactory answer or not, we have to live in the present moment. “Why?” is often prompted by pain, discomfort or dissatisfaction. But the answer may not comfort us. The answer may itself be a question that does not need an answer but must be lived with. This is the mystery of maturity. We realise that answers are unsatisfying, that life is not a question, or series of questions. Life is not a problem to be solved. It is what it is. This letting go of something that seems important to us may be the message of Magpie. 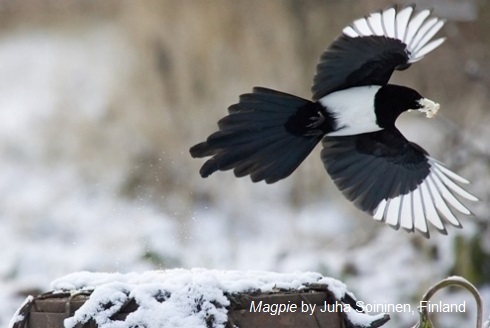 Like us Magpie is fairly omnivorous and can be seen systematically hunting for eggs and young chicks, striking fear into the hearts of parent birds of other, smaller species. Seeing this behaviour it is easy to rush to judgement. We need to remember that the natural world, which we have foolishly attempted to remove ourselves from, maintains its own balance. This is not merely inevitable but good. It keeps populations healthy and embodies the interdependence of all things. In the same way, no matter how hard we pray, God does not protect us from calamity (one of the hardest lessons from the book of Job). This is difficult to grasp, as we want to believe in the loving God of our childhood, but as we grow to adulthood we are invited to develop an adult faith, to pass through the desert of doubt and isolation and discover that there are many things we cannot explain. This is a normal, healthy spiritual journey and not the failure that so many churches seem to treat it as. Beware those who offer you certainty! There is a myth that Magpie collects shiny objects and is something of a sneak-thief. Since research shows this is not the case, I wonder where it arises, and why certain websites seek to perpetuate it? Perhaps it is the doom of the Corvidae that they will always be subject to unfair projections. With her natural adaptability, Magpie invites us to grow to maturity, recognising the flaws in arguments, how beliefs are stories that exist within their own frames of reference. This does not make them untrue, but we are invited to a humble and perhaps more cautious analysis of the things and people we encounter. Black and white? Not when we draw near. How do we appear to others? Like all the Corvids, Magpie has a piercing gaze. She seems to be able to look beyond the surface, past our pretence, and is quick to beat a retreat from us. This again reminds us to look carefully, to accept the complexity of life and to realise that although we may think of ourselves as benign, we do not always appear that way to others. What do we think we know? What do we think we see or discern? Most of us learn to trust our instincts, but it is possible to find out that you are wrong. This can be very hard to take. I remember a period in my own life when I began to question any ability I had to make any judgements at all – I just seemed to come up against other peoples’ different views all the time. I did not find an answer for this, and it may be that my judgement is faulty. But in fact there is no objectivity and those who claim to have it are trying to deceive you. So often differences of opinion are resolved not by who is right or wrong but by who holds power. This calls for wisdom, but there will be times in life when we have to move on and never know what the right thing would have been. When confronted with real uncertainty, can I develop the trust that leads to genuine peace? Which comes first: peace or trust? Dan Papworth is 46 and is married with two children. From an early age he has had a deep love of nature, and studied first Environmental Science and later gained a Masters in Applied Theology. 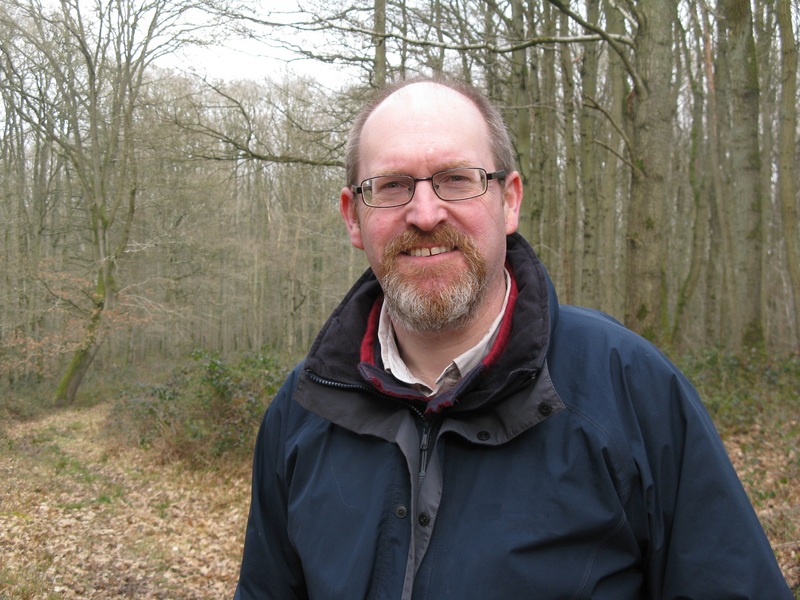 He was ordained in the Church in Wales in 1999 and has worked in hospital chaplaincy and parish ministry. He has been part of Forest Church from its beginnings. He left full time ministry in 2013 to concentrate on family, writing and spiritual accompaniment.